With the continuous development of medical technology, the technology and curative effect of comprehensive treatment on tumor have been improved tremendously. Recently, there comes positive news for breast cancer treatment: The Vacuum-assisted EnCor Minimally Invasive Surgery of Breast Lesion is successfully applied to breast tumors excision and makes precise resection, small trauma, no postoperative scars and immediate recovery in breast surgery available. 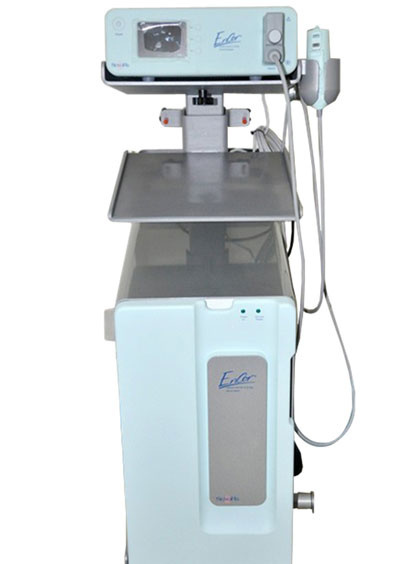 The Vacuum-assisted EnCor Minimally Invasive Surgery of Breast Lesion was already introduced to St. Stamford Modern Cancer Hospital Guangzhou. Member of Committee of Minimally Invasive Therapy in Oncology, Chinese Anti-Cancer Association, Leading expert of minimally invasive treatment on breast cancer in St. Stamford Modern Cancer Hospital Guangzhou, oncologist Dai Wenyan, who has over 10 years experience on minimally invasive therapy for tumor, will be the surgeon of vacuum-assisted minimally invasive surgery of breast lesion. How does the vacuum-assisted EnCor minimally invasive surgery of breast lesion thoroughly excise breast tumors and preserve perfect breast appearance? Under the guidance of B ultrasound or X rays, the puncture needle is inserted into the breast lesion to excise the mass under vacuumed condition, which only requires a piercing hole in millimeters in diameter, even for multiple breast lesions. This surgery is conducted under local anaesthesia. It features small trauma, hidden incision, quick recovery from surgery and no postoperative effect on breast function or shape. 1) The whole surgery is conducted under the precise image guidance and monitoring, which can accurately locate and excise breast lesions. 2) Perfect cosmetic effect with incision diameter in millimeters, no visible suture or scar. 3) One-time needle puncture with unique high-tech hollow puncture needle. 4) Obtains large biopsy sample for accurate breast diagnosis reading. 5) Complete excision of breast tumors and leaves no residue, lesser risk for infection. 6) Quick operation time, a procedure of one single tumor is estimated to be excised in 10-30 minutes. Slight pain and immediate recovery after surgery. 3、A best and broadly applicable choice for modern lady. The vacuum-assisted EnCor minimally invasive surgery is applicable to benign breast lesions and fibroadenoma less than 2.5 cm as well as biopsy of breast lesion. It is a best choice for young and beautiful ladies to treat breast cancer. As an International JCI cancer hospital, St. Stamford Modern Cancer Hospital Guangzhou has been closely following the forefront of technological development to bring in the world's latest advanced technology. Its unique technology—minimally invasive targeted therapy and combination of traditional Chinese medicine (TCM) & Western medicine has helped nearly 10,000 cancer patients around the world effectively prolong their lives and live quality life over the past 10 years. The introduction of Vacuum-assisted EnCor minimally invasive surgery recently will bring more hope for many breast cancer patients.